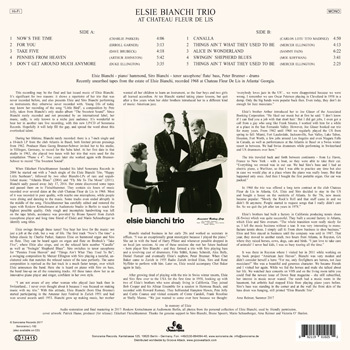 This recording may be the final and last issued music of Elsie Bianchi. 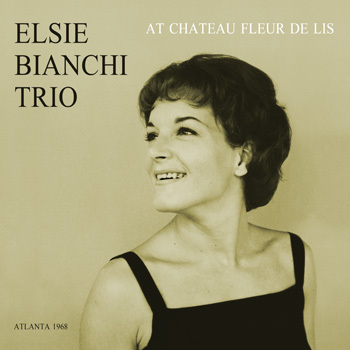 It's significant for two reasons: it shows a repertoire of her trio that was never recorded before, and also presents Elsie and Siro Bianchi performing on instruments they otherwise never recorded with. Young DJs of today may know her recording of the song “Little Bird”, a composition by Pete Jolly, taken from Bianchi’s only studio album “The Sweetest Sound”. Since Bianchi rarely recorded and not presented by an international label, her music, sadly, is only known to a niche jazz audience. It's wonderful to hear her in another rare live recording, with this new LP/CD of Sonorama Records. Hopefully it will help fill the gap, and spread the word about this overlooked talent. 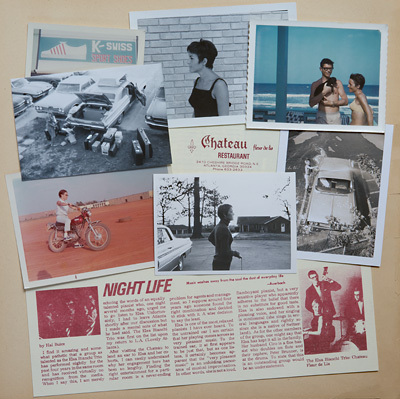 During her lifetime, Bianchi rarely recorded: there is a 7-inch single and a 10-inch LP from the club Atlantis in Basel, both limited private pressings from 1962. Producer Hans Georg Brunner-Schwer invited her to his studio, in Villingen, Germany, to record for the Saba label. At her first date in that studio in 1963, she played two tunes with her trio that were used for the compilation “Piano x 4”. Two years later she worked again with Brunner-Schwer to record “The Sweetest Sound”. When Ekkehart Fleischhammer founded his label Sonorama Records in 2004 he started out with a 7-inch single of the Elsie Bianchi Trio, “Happy Little Sunbeam“, followed by two other Bianchi-LPs of rare and unpublished music: “Atlantis Blues” (2004) and “Fly Me To The Moon” (2011). Bianchi sadly passed away July 17, 2016. Her estate discovered some tapes and passed them on to Fleischhammer. They contain six hours of music recorded over several dates at the club Chateau Fleur de Lis in 1968. Most of it was recorded in poor quality, with maybe one microphone, while people where dining and dancing to the music. Some tracks even ended abruptly in the middle of the song. Fleischhammer has carefully edited and restored the tapes with Roskow Kretschmann at Audiomoto Studio in Berlin to reach the highest possible quality. Only rough and incomplete handwriting was left on the tape labels, assistance was provided by Bruno Spoerri from Zurich (saxophone player and long time friend of Elsie) and Mario Schneeberger to identify song titles. Elsie swings through these tunes! You hear her love for the music: not just a job at the club, but a way of life. The first track “Now’s The time“ a bebop classic by Charlie Parker, features Elsie on hammond organ and Siro on flute. 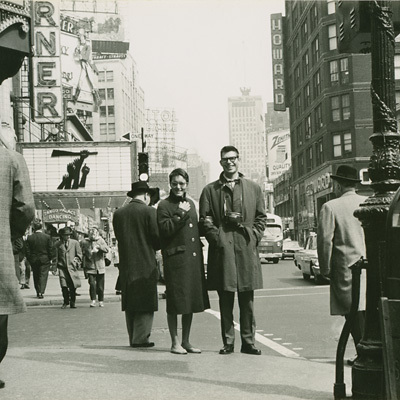 They can be heard again on organ and flute on Brubeck's “Take Five”, where Elsie also sings, and on the relaxed latin number “Canalla” as well as “Swingin’ Shepherd Blues”. Siro switches to tenor saxophone for “Pennies From Heaven” and “Things Ain’t What They Used To Be”; a swinging composition by Mercer Ellington with Siro playing a tasteful, uncluttered solo that matches the relaxed nature of the tune perfectly. The same composition is reprised as the last track in a much faster tempo, over which Elsie announces the band. Here she is heard on piano with Siro on bass, the band line-up on all the remaining tracks. All these tunes show her as an innovative piano player and singer, confident in her own style. “I am not aware of any other woman who played Jazz back then in Switzerland... 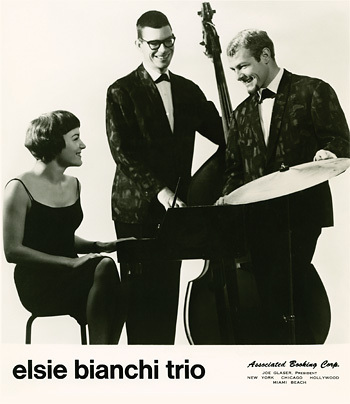 I never even thought about it because I was focused on making music with my trio.” With this attitude, Elsie Bianchi (born Elsa Brunner) started participating in the Amateur Jazz Festival in Zurich 1951 and had won several awards until 1953. Bianchi grew up making music, her mother wanted all her children to learn an instrument, so the four boys and two girls all learned accordion. At ten Bianchi started taking piano lessons, but quit after a few years when her older brothers introduced her to a different kind of music: American jazz. Bianchi studied business in her early 20s and worked as secretary in offices. “I was an exceptionally great stenotypist because I played the piano.” She sat in with the band of Harry Pfister and whenever possible dropped in on local jam sessions. At one of these sessions she met her future husband - horn player Siro Bianchi - and they formed a trio with Siro playing bass and a revolving cast of drummers; Fritz Stähli, Kenny Schmidt, Alex Bally, Daniel Humair and eventually Elsie's nephew, Peter Brunner. When Chet Baker came to Zurich in 1955 Radio Zurich invited Elsie, Siro and René Nyffeler to perform with him. Later on, Elsie would accompany Chet Baker again in Italy. It was there in Royston where I visited her in 2011 while working on my book project “American Jazz Heroes”. Bianchi was very modest and didn’t consider herself a hero: “For me, only firefighters are heroes, not Jazz musicians!” She was a beautiful and generous character. We became friends and I visited her again. While we fed the horses and mule she talked about her life. We watched Jazz concerts on VHS and on the living room table you could find the newest issue of Down Beat magazine - she still subscribed, her interest in music never waned. The ranch had a music room in the basement, but arthritis had stopped Elsie from playing piano years before. Siro's bass was standing in the corner and at the wall the front skin of the bass drum was hanging, still printed “Elsie Bianchi Trio”. Thanks for genuine support to Siro Bianchi, Bruno Spoerri, Mario Schneeberger, Arne Reimer and Victoria O' Hanlon.